Anyone can dream, but often those in the ordinary working class find themselves struggling to aspire them while keeping up with the present’s tough financial situations. 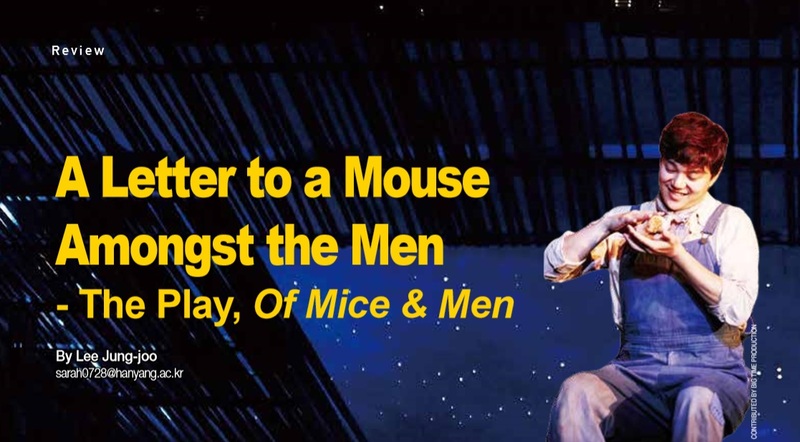 The play, Of Mice & Men, is based on John Steinbeck’s famous 1937 novella, and starts with two main characters: George Milton, an intelligent but uneducated man, and Lennie Small, a mentally disabled and bulky fellow. The two migrant ranch laborers work on farms to sustain their living but flee from one farm after another, due to Lennie’s unintentional mistakes. In this particular scene, Lennie and George are running away from a farm after Lennie touched a young woman’s dress and would not let go. His obsession with soft things and his inability to control his strength led to Lennie being accused of sexual assault, and George having to rescue Lennie from the predicament. As George and Lennie camp out for the night, George complains to Lennie about how his life would be better without having to care for Lennie and fix his mistakes. But despite Lennie’s antics, it becomes clear that the two are deeply devoted to one another. While George may not understand Lennie, the two are always there for each other in times of need. The next morning, the two arrive at a nearby ranch. George fears how the rest of the workers will react to Lennie and tells him that he will do all the talking. When they meet Candy, an old handyman with a missing hand and an old dog, George tells him that they are cousins, and that a horse kicked Lennie in the head when he was a child. They also meet Curley, the boss’ son, who is small in size and violent in nature. When Curley meets Lennie, he picks a fight with him due to his jealousy of Lennie’s bulkiness. They later learn from Candy that Curley is a newly married man, is very possessive of his wife, and full of jealous suspicion. Thus, when Curley’s wife tries to have a conversation with George and Lennie, George simply dismisses her. George senses trouble that could entangle them from both the woman and her husband, so he warns Lennie to stay away from her. As the ranch workers get back to the farm after lunch, George and Lennie meet Slim, a skilled mule driver who commands great authority on the ranch, and Carlson, another ranch-hand. The other workers find out how strong Lennie is and remark on how Lennie may not have the brains, but that his strength comes to great use. During the play, whenever Candy passes by with his elderly dog, Slim and Carlson both comment about how it has an unbearable stench. They suggest shooting the dog, and after further discussion, Slim persuades Candy to give in. Candy asks Slim to give him one day with his dog, but Carlson, who could not bear the stench any longer, shoots the dog without informing Candy that afternoon. In exchange, Slim offers Candy one of his newly born puppies, which Candy refuses. Lennie ends up keeping that puppy instead, and this satisfies his joy in petting soft things. But even with a puppy, Lennie tells George: “I don’t like it here, this is a bad place”. When George tells Lennie that they have no choice but to work there for food and money, Lennie begs George to tell him his favorite story, a story about their dream farm. George then begins to tell Lennie about the few acres of land and the small farm that they will own in the future. Here, he says that they will be able to grow their own food and tend their own livestock. Lennie’s favorite part of the story is when George mentions that Lennie will be the one taking care of the bunnies and the alfalfa for the bunnies to eat. These bunnies also play a big role in making sure Lennie does not do anything bad, because he fears that George will not let him take care of the bunnies in the future if Lennie is caught misbehaving. his anger. He then finds Lennie and picks a fight with him. Because Lennie was told to “Be good, and don’t do anything bad”, he does not retaliate when Curley first strikes him several times. As Lennie screams: “Why are you doing this to me? I didn’t do anything wrong!”, George tells Lennie to hit Curley back, unable to watch his friend get beat up any longer. Lennie then loses control and injures Curley, breaking his arm. George and Lennie flee from the situation to call for help, and Candy warns Curley that if he gets George and Lennie fired, Candy will tell everyone what happened and make sure Curley is the laughingstock of the farm. The next night, while all the other men are out playing drinking games, Lennie is left alone in the farm with his puppy. However, while he plays with it, he accidentally kills it, and he cries about how George will never let him take care of the bunnies in their dream farm again. Just then, Curley’s wife passes by and comforts Lennie sobbing over his dead puppy. As the two confide in each other, she tells him about how her marriage is a disappointment, and how she is running away to achieve her dreams of being a movie star to obtain her freedom. She talks about how she has been living a restricted life since she was a child, and how she is ready to explore the outside world. In Of Mice & Men, each character has a small dream, and they cope through their lives and work to achieve them. Through George and Lennie’s hardships, they both dream and work towards living a different life than their present one, which Candy eagerly hops on to. Also, Curley’s wife’s determination to run away from her restricted life also symbolizes her struggle towards achieving her dream of freedom. However, this play also depicts the loneliness in each character. In the middle of the play, George freely confides in Slim about how Lennie is actually not his cousin, but that they are childhood friends. George also confesses that when he was a teenager, he learned to never take advantage of the weak after bullying Lennie in front of his friends. Curley’s wife openly confesses her feelings and dreams to George and Lennie when they have just met, and Curley’s obsession of keeping his wife by his side at all times are also signs of loneliness. Candy, after his dog’s death, immediately finds comfort in the idea of George and Lennie’s farm. The fact that most characters easily admit their fears to complete strangers show their desperation. Although this play’s context is based on early 1900s California, its story can be related to our current reality. Most of us have our own dreams and we tire ourselves in the present, in the hope of grasping those dreams in our hands. We confide in others and relieve ourselves by chatting our stress away with others. And yet, many of us still feel alone in this individualistic society. Through this play, we hope that you will find small happiness in your lives that keeps you going. You may feel like a small mouse, fighting through a society with the strong and powerful. Take the time to find yourself a companion like George and Lennie and keep pursuing. Dream of your own farm and your bunnies, and soon you will have it.